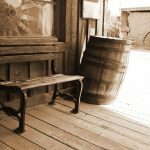 I am so excited to have Julene guest post for me today. 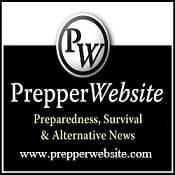 This lady is amazing and has a wonderful blog called Prepared Today. You will love everything she writes! 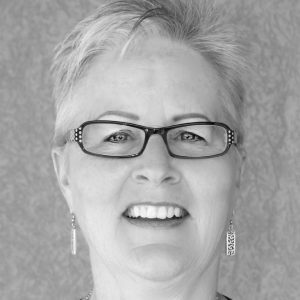 I met Julene a few years ago when we were both teaching or attending classes at Honeyville Grain. She is actually like a sister to me and I am proud to call her my friend. I love making homemade pasta, and after today I think you will want to make some as well. Words by Julene: What started off as a Church assignment for me has turned into a fun adventure. 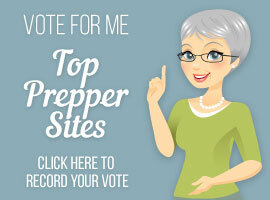 My blog, Prepare Today, is all about the food storage process. 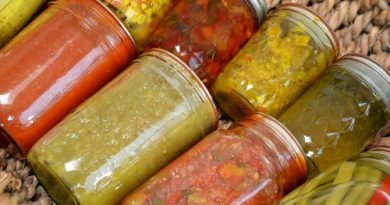 I find easy, frugal ways to slowly build your food storage and use it in your everyday life. 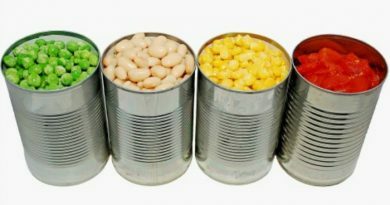 Food storage is a process, not an event, and I try to make it simple and stress free! 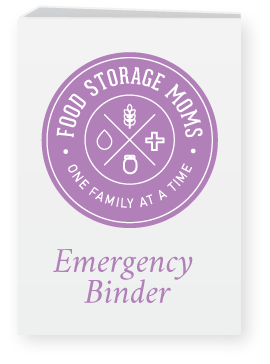 I am a mom of 5 hungry children and I use my food storage everyday, and also for life’s little emergencies. 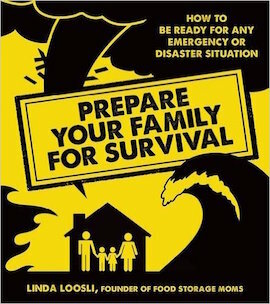 Food storage isn’t just for some unforeseen event, but for everyday emergencies. Thanks to Food Storage Moms for letting me visit! Taking preparedness classes at Honeyville Grain has really expanded my knowledge on cooking with storage. Learning how to make homemade pasta is one area that I have always been intimidated by, but I have taken several classes at Honeyville and I feel semi-confident that it can be done. I say semi-confident because I need to practice quite a bit more before I could say I am an expert at pasta making. I gave up on the ravioli and my girls got to play with the ruined dough. Next I tried making a pasta for the first time and it just wasn’t working either. The dough was too wet and it broke while I tried to roll it out, so I kept adding more flour to it and that didn’t help at all. I had a dry, crumbly mess. Once I got the dough rolled out I placed the filling on top and I tried to roll it out with my ravioli rolling pin. That is when the four letter words and frustration hit the fan. The children were asked to leave mommy alone for awhile. The little pockets of ravioli were bursting and the filling was popping out. A lot of the dough was sticking to the rolling pin. I needed a breather. It took almost 4 hours to get all this done and I had to throw most of it out. I gave up on the ravioli and my girls got to play with the ruined dough, again. 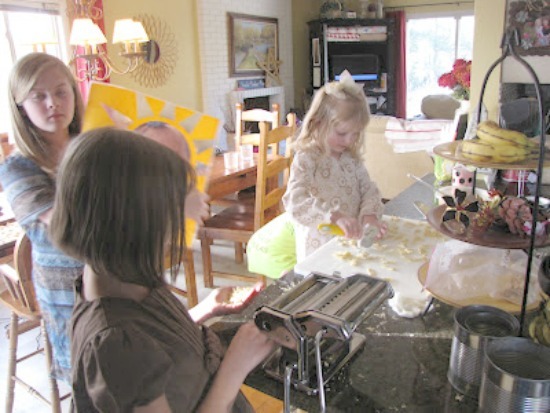 Lisa Barker, the Honeyville manager, taught the “hands on” homemade pasta class. It was so helpful to feel the dough and know when it had enough flour. She took us step by step through the whole process and I was amazed that it really only takes about 30 minutes to have fresh spaghetti for dinner. After the class I went straight home and tried it again. I am happy to say it worked. My kids even helped! So I was really reluctant to try this again, but after going through a class at Honeyville my confidence was back. I started simply with homemade spaghetti, which is where I should have started before the ravioli incident. The recipe contains simple ingredients and is pretty simple to put together, especially if you have a pasta roller. This is is my 8 year old learning how to make pasta. He thought it was really cool to turn the handle and make the dough grow. Place the flour and salt in a mound on your workspace. Create a well in the middle with your finger. Place eggs and olive oil in the middle of your well. 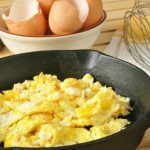 Using a fork, gradually and gently whisk the eggs, eventually incorporating your flour until all ingredients are stiff, but still moist and a dough is formed. Knead until smooth, but not sticky or tacky (about 10 min), and then cover with a damp cloth or put in plastic wrap to rest for 20 minutes. 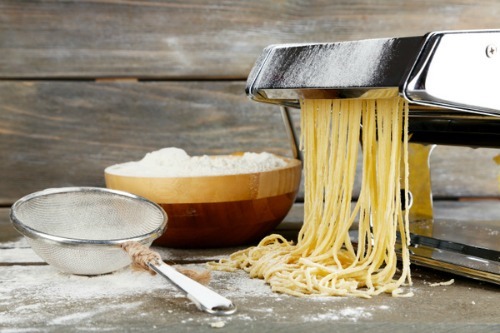 Roll in pasta machine to desired shape. I divide my dough into thirds using one section at a time and start rolling it in my pasta roller. 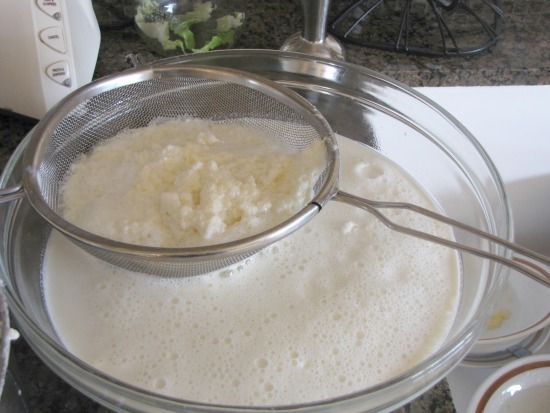 It will grow quite a bit as it thins out and you will want a manageable piece of dough to work with. My pasta roller (Imperia) starts out at a number 6 as the widest setting. I roll the dough once through, fold the dough into thirds in on itself, then roll through the #6 notch again. Roll through 2 more times without folding. I move the number notch to 5 and roll the dough 3 more times (no need to fold the dough in on itself anymore, just roll it). I do the same all the way to number 1. Other pasta rollers may have a different number system, so check your instructions before beginning. You want to start rolling the dough through the widest setting down to the narrowest setting. The dough should be thin but workable. If you get holes or tears just start over at number 6 and fold the dough again into thirds. Then roll through the machine clicking down a notch every 3rd roll. I try to have the dough go through 3 times for every notch I turn the dial. It really did help to have the kids working with me. It was easier if one person turned the handle while another fed the dough through the pasta machine. After rolling the dough, now it is time to make it into spaghetti. This part was my favorite because it was so simple and yet came out so perfectly! The spaghetti attachment was already attached to my pasta machine and we only had to move the handle over to the other slot to make it work. Just turn the handle while feeding the dough through the spaghetti slot, and voila, you have spaghetti. Once the noodles are cut, sprinkle them with a little flour to keep them from sticking. You can cook them right away (that’s what we did) or hang them to dry and use them at a later time. My 4 year old was making this batch. It really is a great way to have your children help in the kitchen. If you are cooking your pasta right away you only need to boil it for about 2-3 minutes and it’s done! We cooked it for lunch and everyone loved it! Thanks again Julene for this awesome demonstration of making pasta! I am going to make some for dinner, what about you? Mare: Homemade pasta is the only way to go! I use fresh ground wheat in mine. Egg pasta is great if you are going to use it right away, or freeze it. If you replace the eggs with a little water and dry it by hanging it over wooden clothes dryer rungs, you can package it for short term food storage. It’s best used within about 3 years, but I’ve eaten it, and it’s been just fine, as old as 7 years! 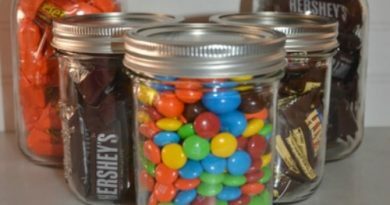 I never even thought about making this for storage. Well duh. Homemade is always better, isn’t it?